Hi Tails of the Tundra! We're SO happy to read the stories from your website-- thank you for sharing! My sister & brother-in-law are "Kathy & Bob" who adopted "Isis & Dervish," now known as "Nikki & Dervish." I'd have to say we were probably partly to blame for that... although I say this with a big smile! I love your reference to the "potato chip" theory... I think we're well on our way to the whole bag of chips here! We have three rescued huskies now and who knows... another could make it's way into our hearts just when we least expect it. 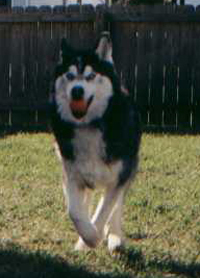 Back in 1998, we rescued "Bear" from Pensacola, Florida. He came at a time in our lives when, ironically, we needed him most. My mom had just passed away suddenly and we had moved to Florida with my husband's job, far away from my family. I was feeling quite lonely and struggling with these feelings-- when Bear literally walked into our lives. He quickly warmed up to me and became my friend when I needed one most-- and hasn't left my side since. He was 12 weeks old when we found him and he's 10 years old and going strong! A year later, we were transferred with my husband's job again and living in Mississippi, enrolled in our fourth obedience class with Bear. (Did I mention he was mischevious?) At the completion of the class, we were asked if we'd like another Husky... hence, the potato chip theory: you can't have just one. So, we pick "Buddy" up from a neighboring town, after reasoning with him for hours. I say this becuase he was terrified of humans-- he had been abused, he had mange, and after adopting him, we learned he had a tumor and needed surgery and chemo treatment as well. More than anything, Buddy needed our love and patience, and he's given it back to us threefold! Buddy was about two when we adopted him, so he's going on 12 now! He's had another bout with cancer, but we fought that again with surgery and treatment. We also almost lost him to Hemolytic Anemia, but fortunately, our Veterinarian had seen a similar case and sprung into action so quickly that Buddy came back, quite literally, from the brink of death. The beautiful thing about this story is that we can't take any of the credit for Buddy's healing-- it was Bear who "nursed" him back to health. When Buddy first came home from being hospitalized, it was Bear who carried food in his mouth and dropped it off in front of Buddy so he wouldn't have to travel too far to eat! It was Bear who curled up close to him on his bed to keep him company and Bear who licked his wounds. We were blessed to be able to sit back and watch the compassion an animal can show toward another animal-- and people say that animals don't have empathy... I beg to differ! Years later, we adopted our third dog, Wolf, from the SPCA in Virginia Beach. We had moved again--and this time, our good friend had seen a Husky at the SPCA who brought her to tears with his sad eyes. He had been through numerous homes and shelters-- and apparently, his energy and misbehavior had taken it's toll on previous owners. Our SPCA is not a no-kill facility and she felt his time was imminent... so after a tearful phone call, we were at the SPCA and within minutes, getting our faces licked by who we now know is Wolf! We took him home and he was accepted almost immediately into the pack, but as everyone knows, there's a pecking order and he's most definitely a Beta! We now have three children (the two-legged kind!) as well and Wolf is very much "their" dog. He brings so much enthusiasm and energy to our home, even though he has a penchant for eating cell phones and shoes, we still love him and really, can't imagine life any other way. So, getting back to Kathy & Bob-- it was Kathy who came to visit our home in 2000 (before adopting Nikki). She fell in love with our Huskies and quickly made her way back to Lutherville to inform Bob that Huskies were in their future! 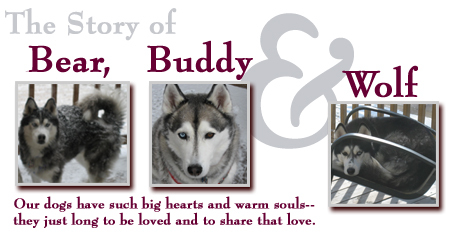 Thanks for letting us share our story of Bear, Buddy & Wolf-- and THANK YOU for doing all that you do for these dogs!